I almost always put together a big fancy dinner for my boyfriend on Valentine's Day, but this year I decided to take a break. Instead, we're going to let someone else do the cooking for a change and enjoy a romantic dinner in the next city over, Thomasville, on a sort of "staycation". Although I'm taking a load off this year, I still wanted to do a little something for Matt and my close friends. Sending Valentines seems to be a dying art if you aren't in pig tails and in the 4th grade. I say let's bring back this childhood tradition and show some love to our friends and loved ones. 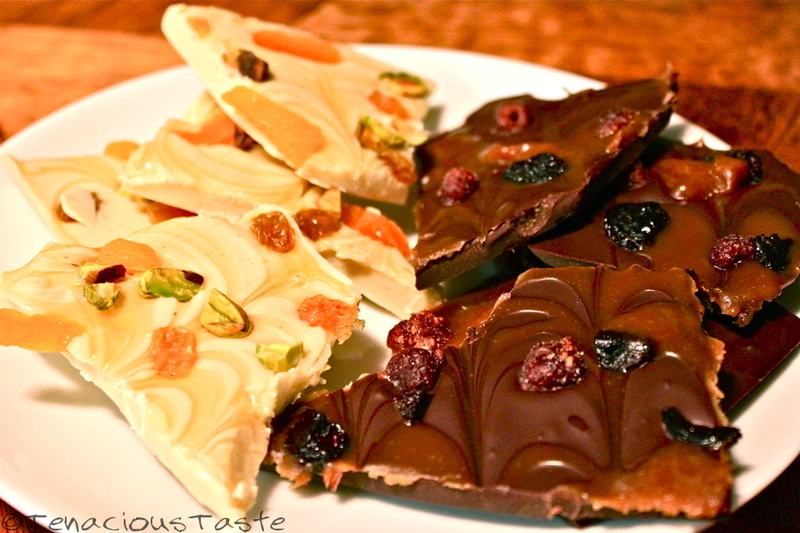 Making chocolate bark is incredibly simple and has endless possibilities in the creativity department. Its also really easy to package and makes you look like a "pro" chocolatier! I decided to try two different combinations, including two different flavors of chocolate. Whether you make one or both, you'll be channeling Jacques Torres "Mr. Chocolate" and surprising all your friends with these tasty treats! Heat double boiler (or glass bowl inset in a sauce pan with boiling water) over medium-high heat. Get lots of kisses for your hard work! 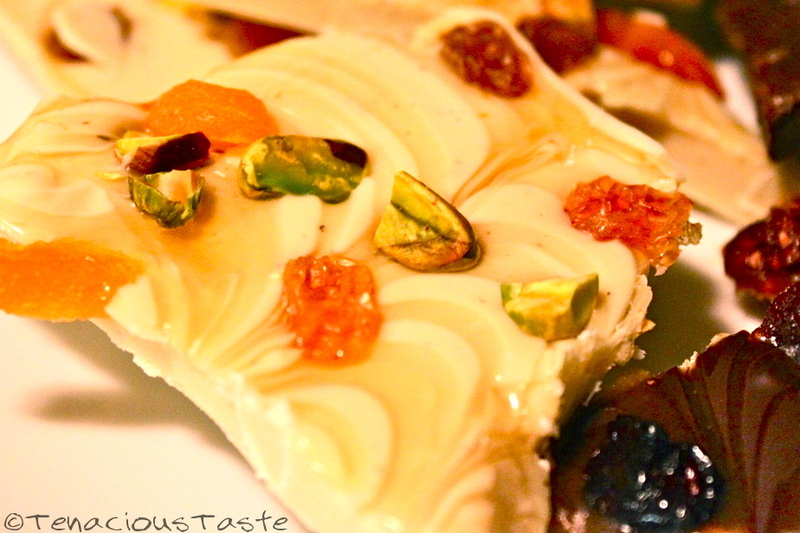 There are so many different combinations you can try for this simple easy dessert! Its good to at least have one type of dried fruit, one variety of nut, and then some extra sweetener especially if the chocolate is extra dark. I omitted nuts in the dark chocolate because of nut allergies so you can always have some bark for those that cannot enjoy nuts. Adding toffee, crushed cookies, or chopped pretzels can also add a nice crunch instead of nuts. Special Tip: sprinkle in some thick sea salt or gray salt for texture and for sweet and salty lovers! 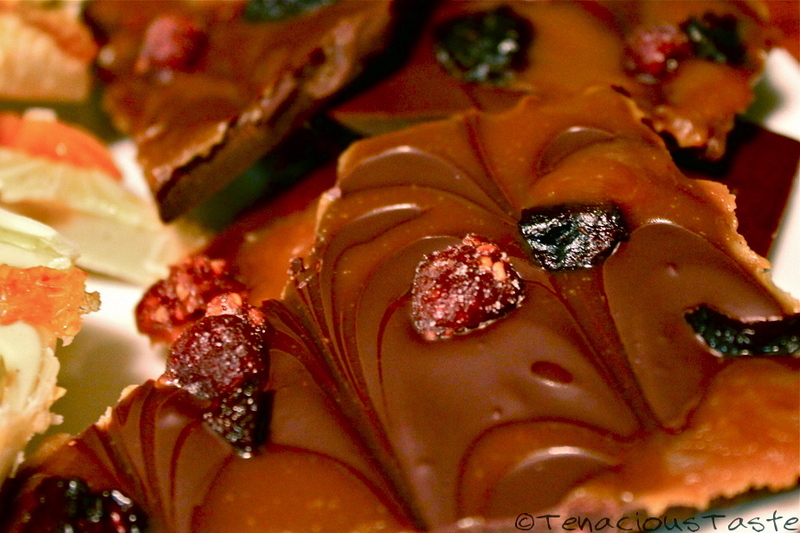 The honey and the carmel can get pretty sticky so make sure the chocolate is extra cold before serving, that way the honey and caramel have a little firmness and wont get all over the place! You can also mix chocolate flavors together. Melt them separately first, then you can either layer them on top of each other by pouring in one flavor then letting it cool and then pouring the other on top... OR you can pour down one flavor then drizzle in the other and cut through the ribbons to make the ripple design!